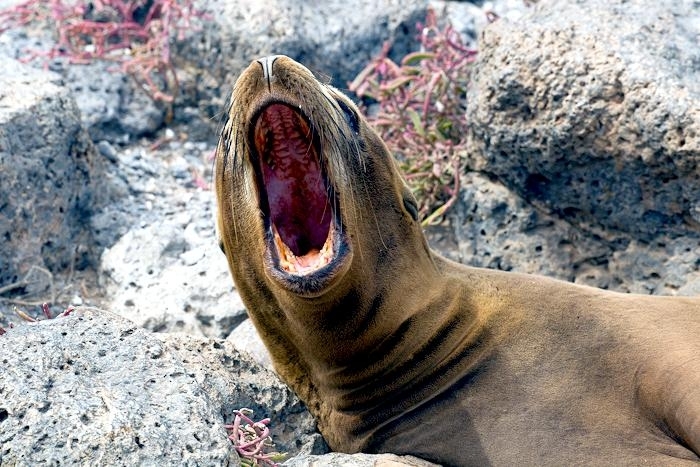 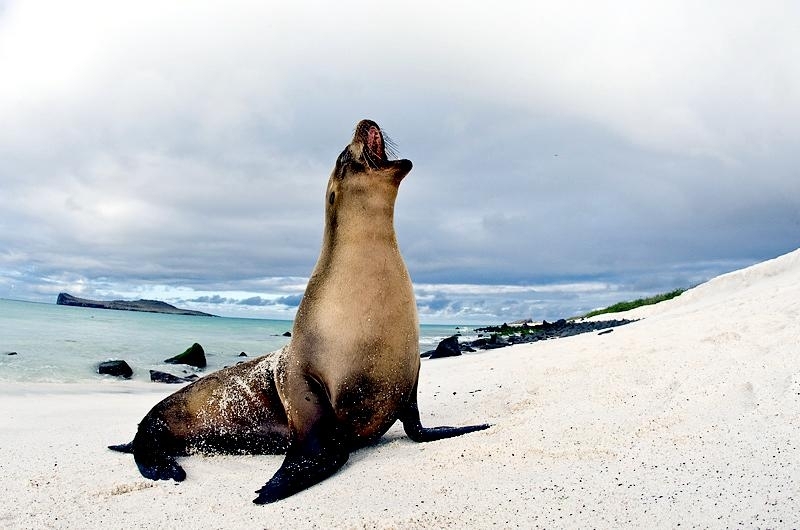 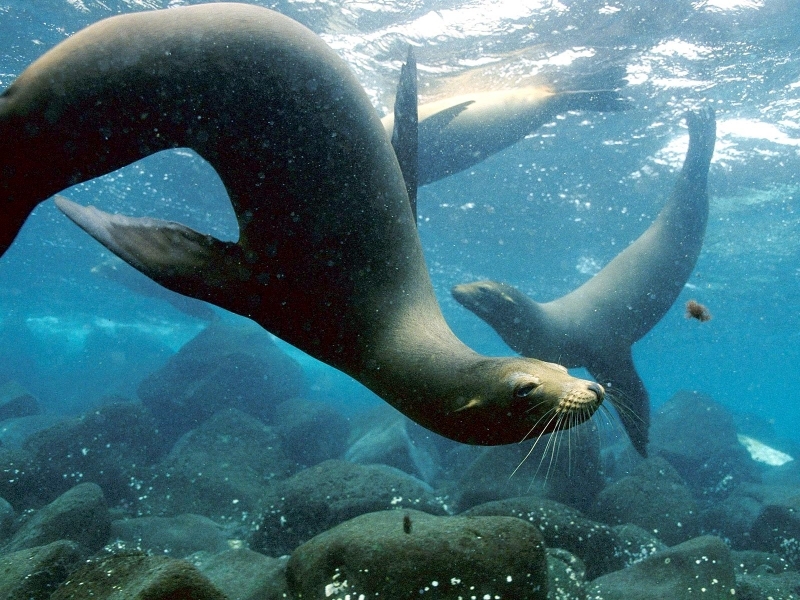 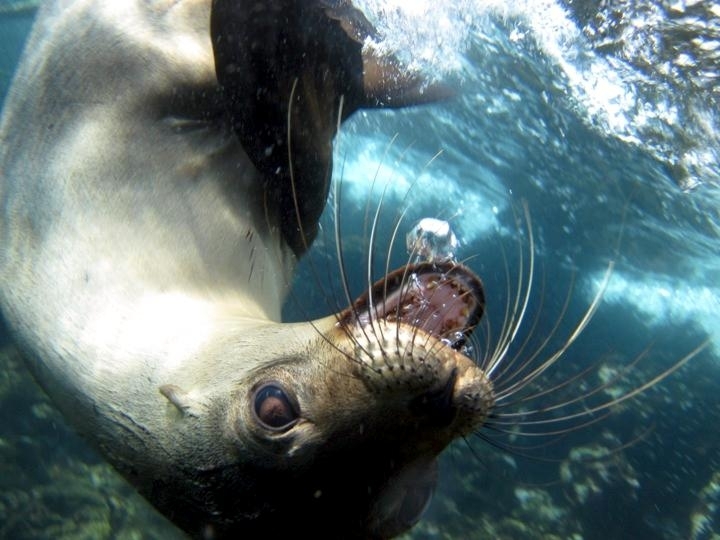 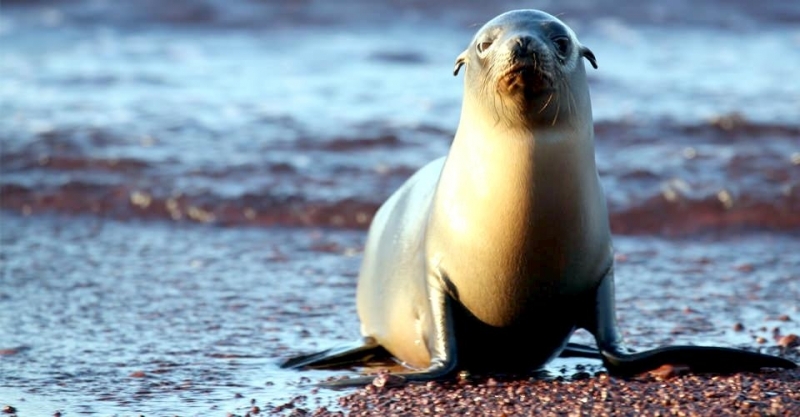 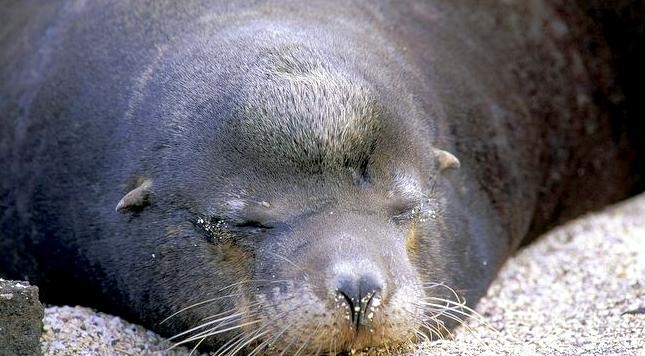 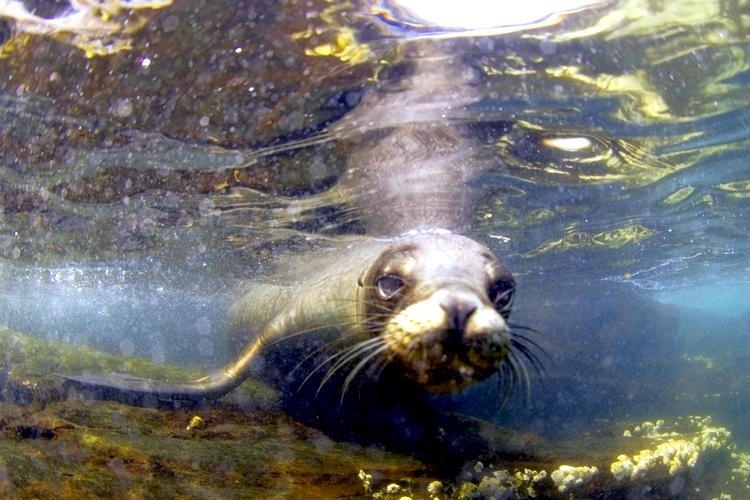 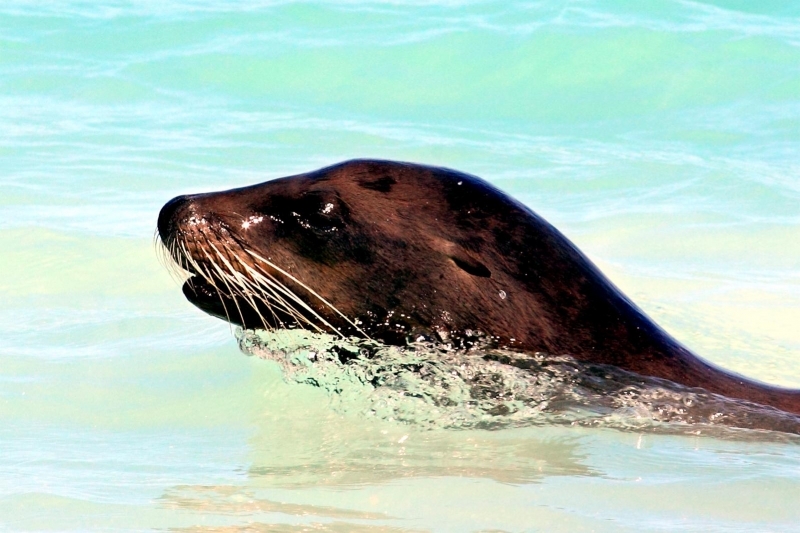 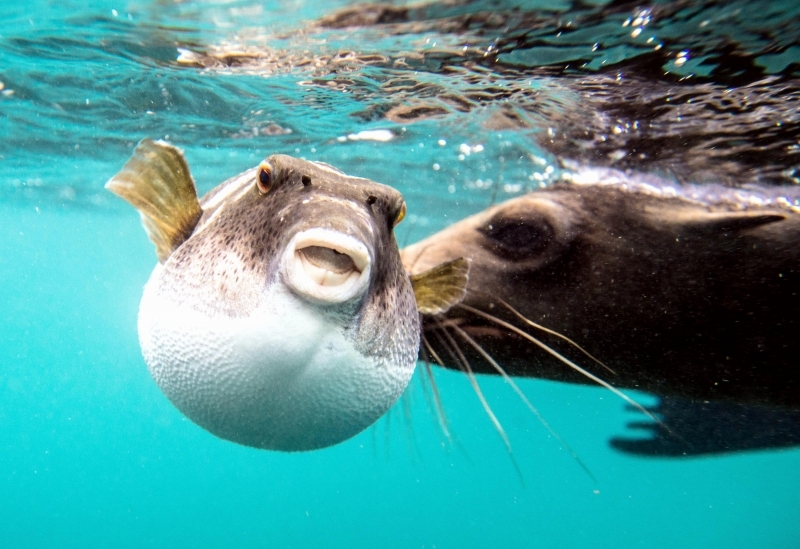 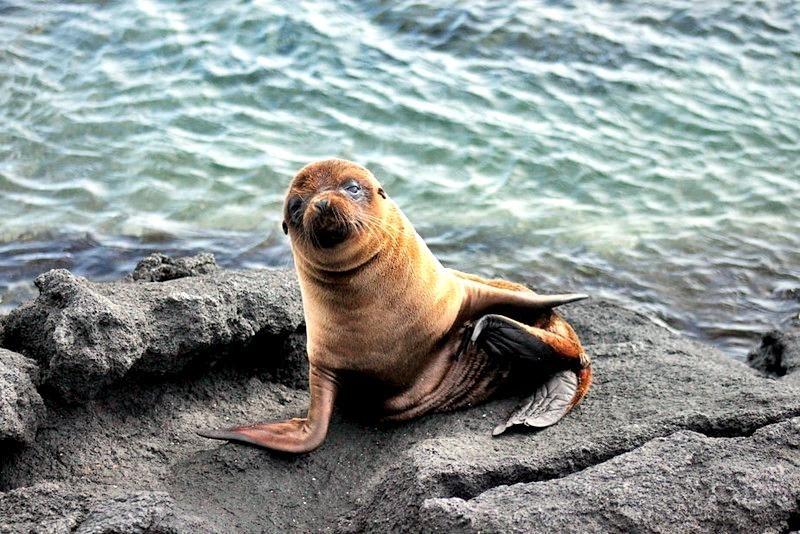 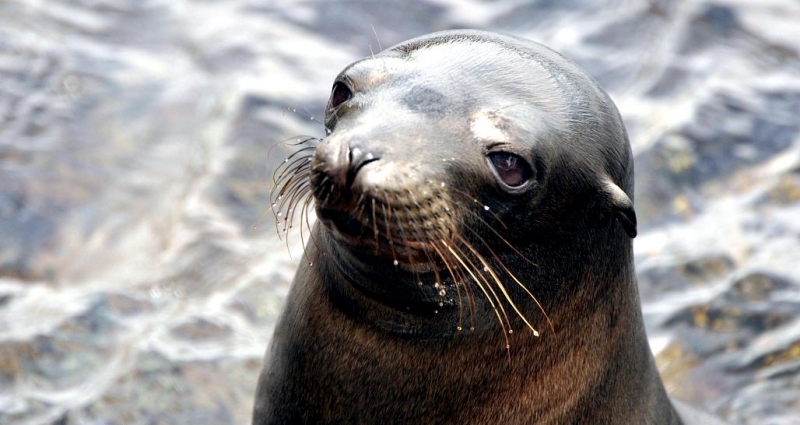 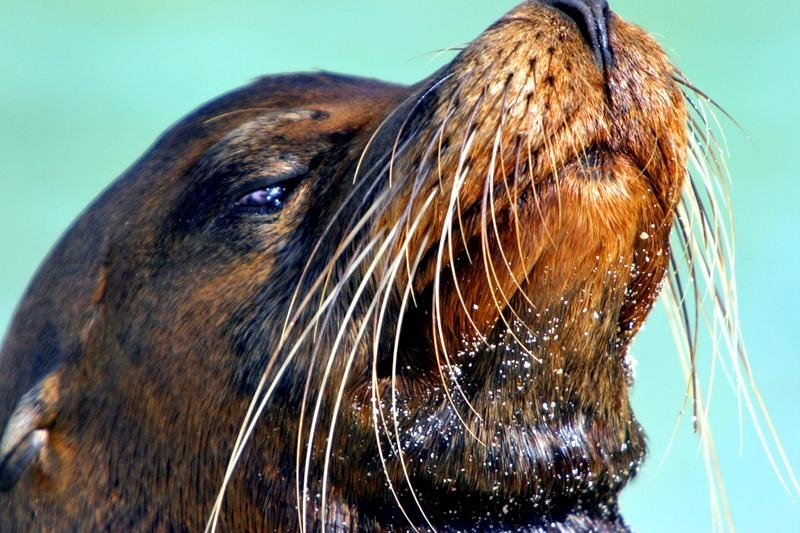 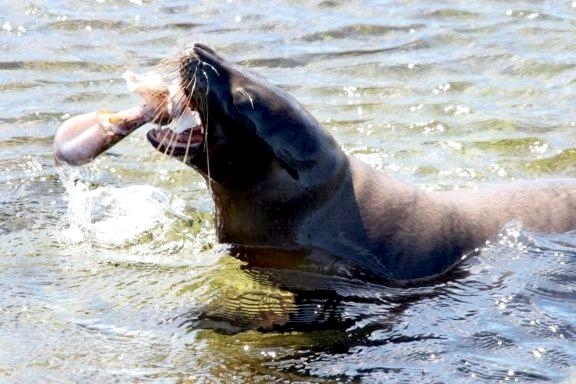 The Galápagos Sea Lion is essentially a coastal animal and is rarely found more than 16 kilometers out to sea. 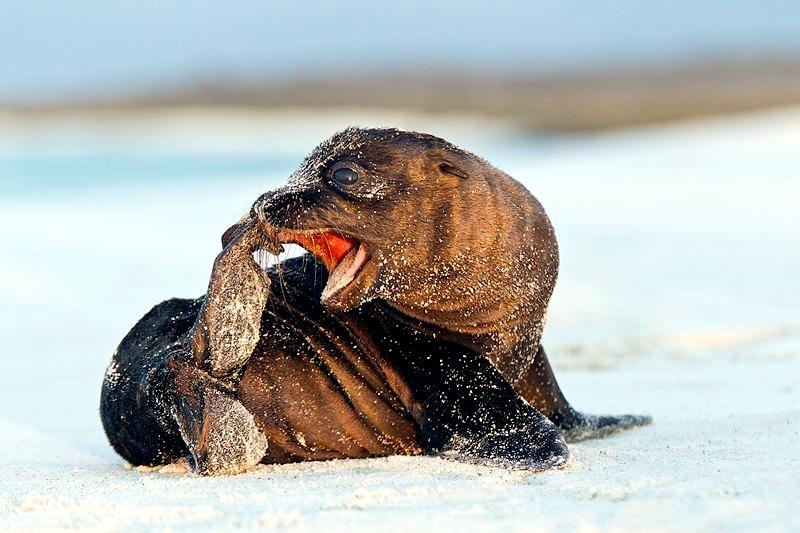 Individuals are active during the day and hunt in relatively shallow waters (up to about 200 meters deep) where they feed on fish, octopus and crustaceans. 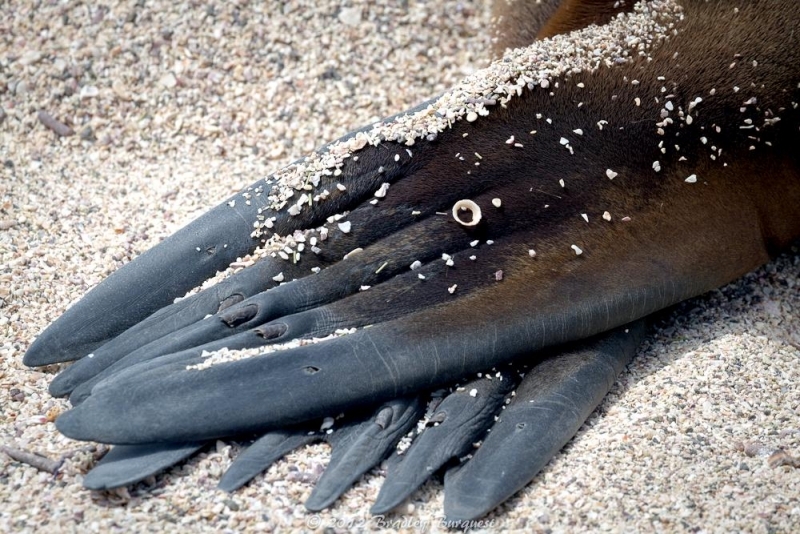 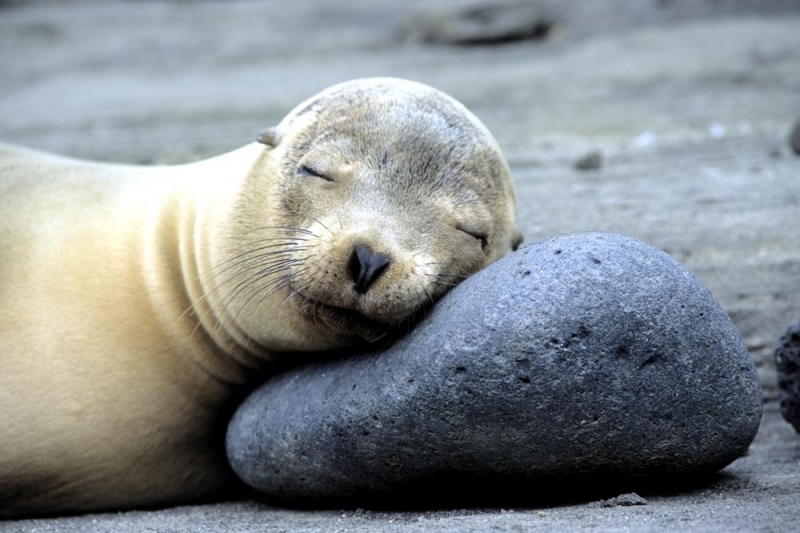 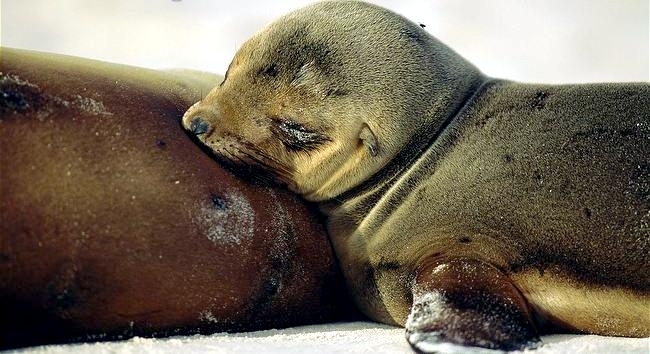 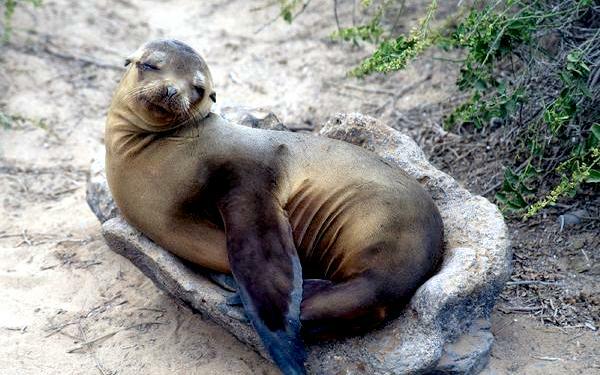 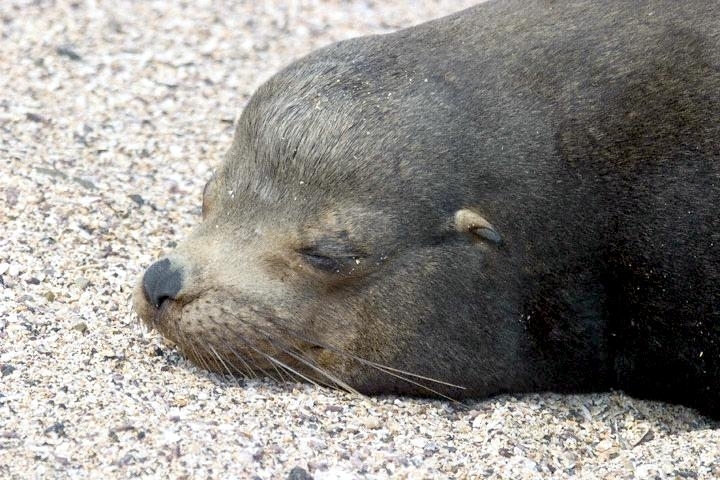 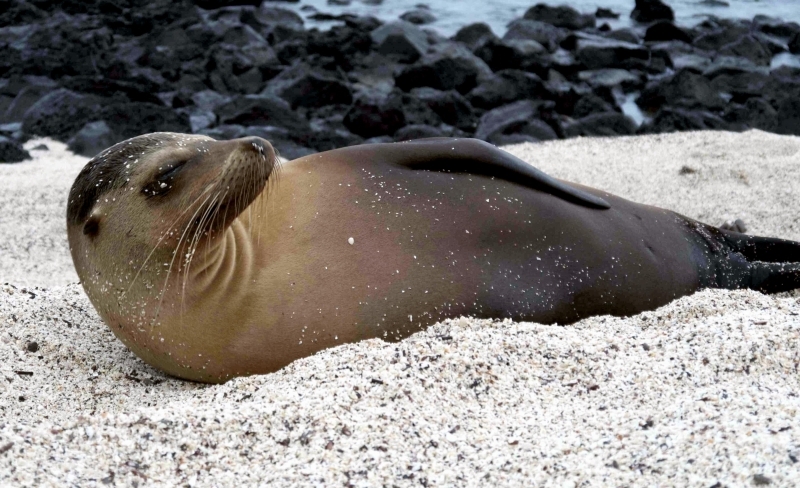 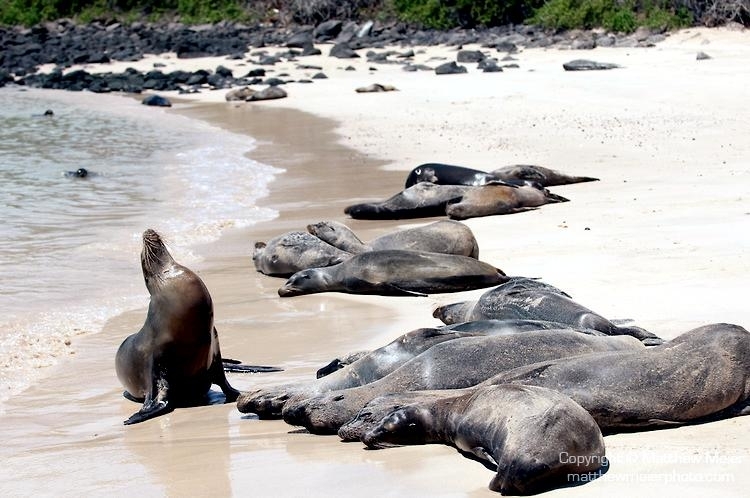 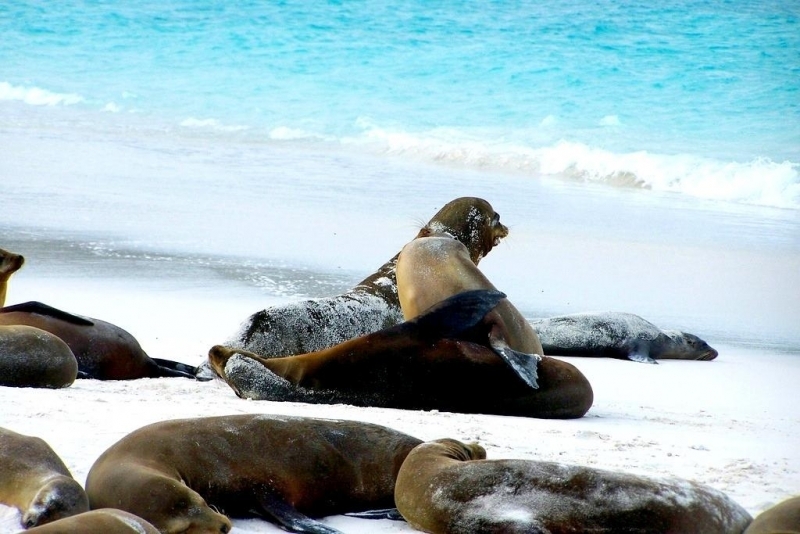 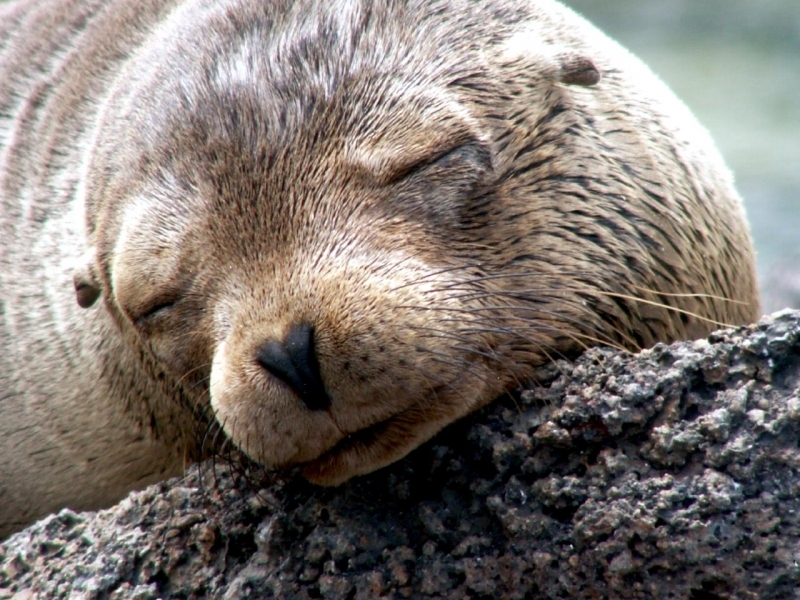 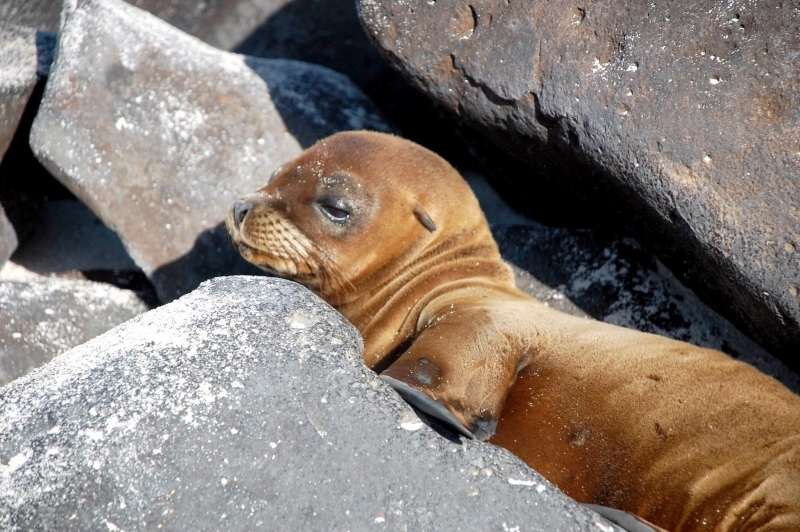 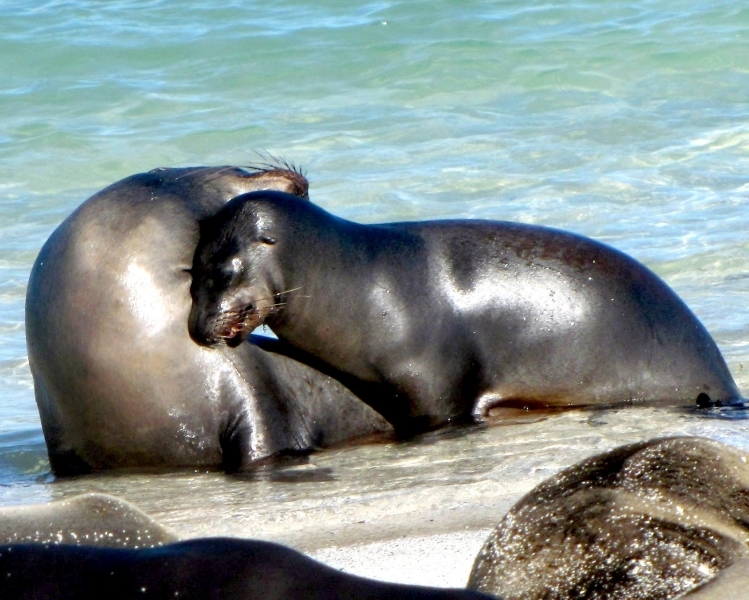 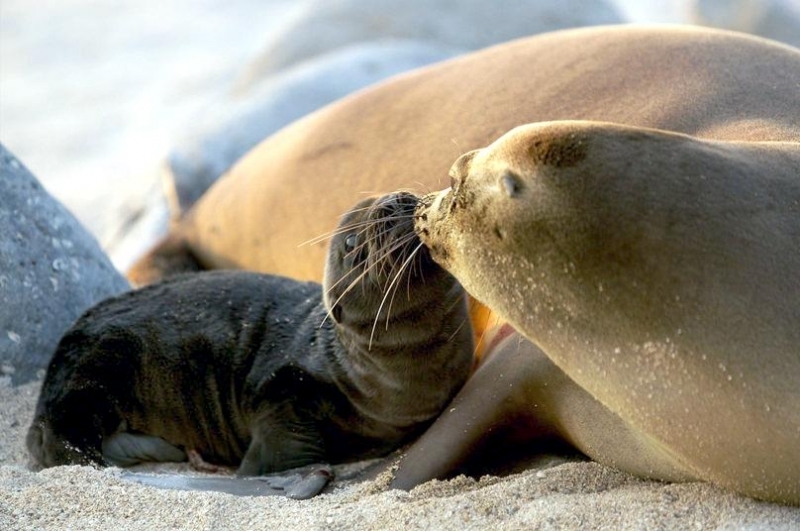 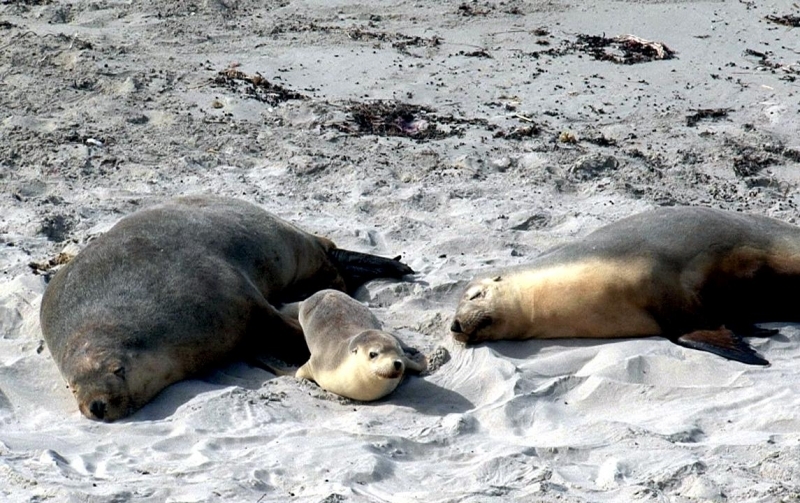 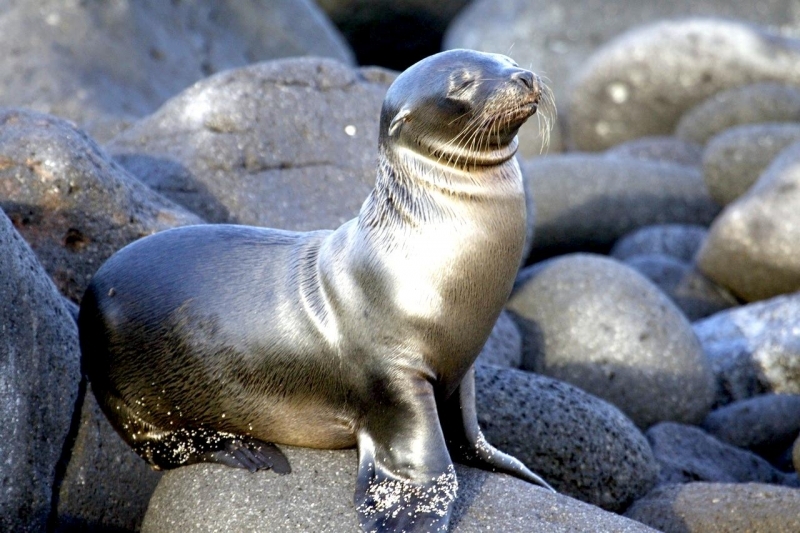 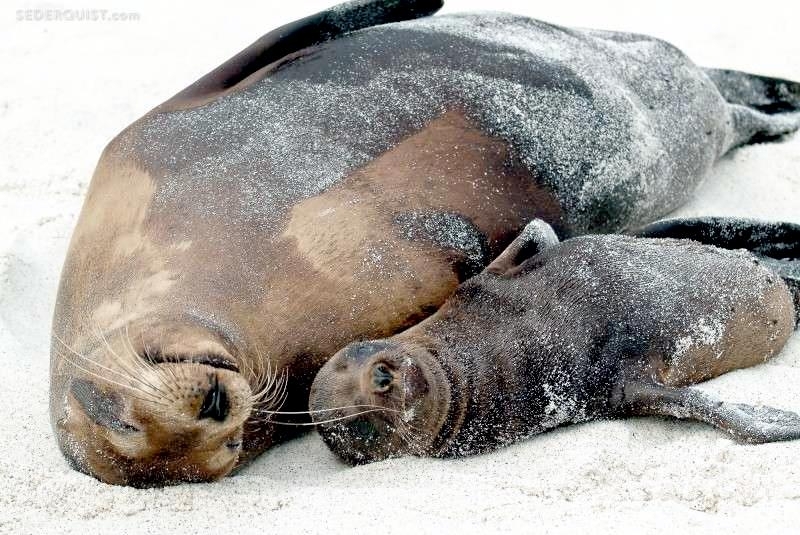 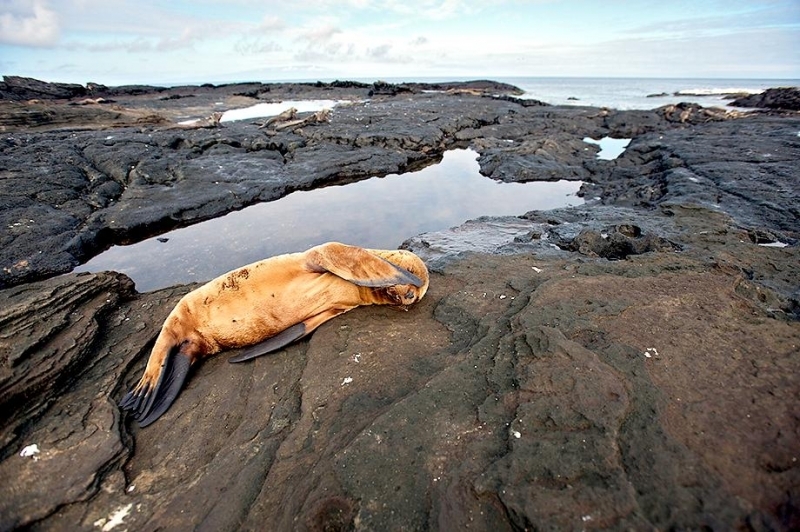 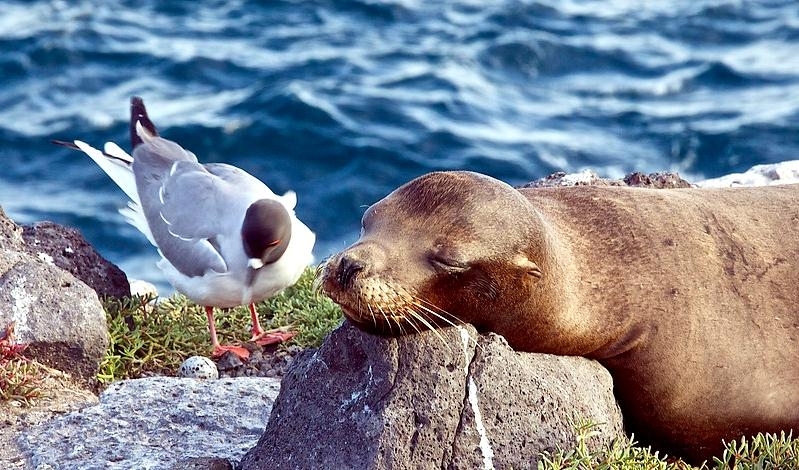 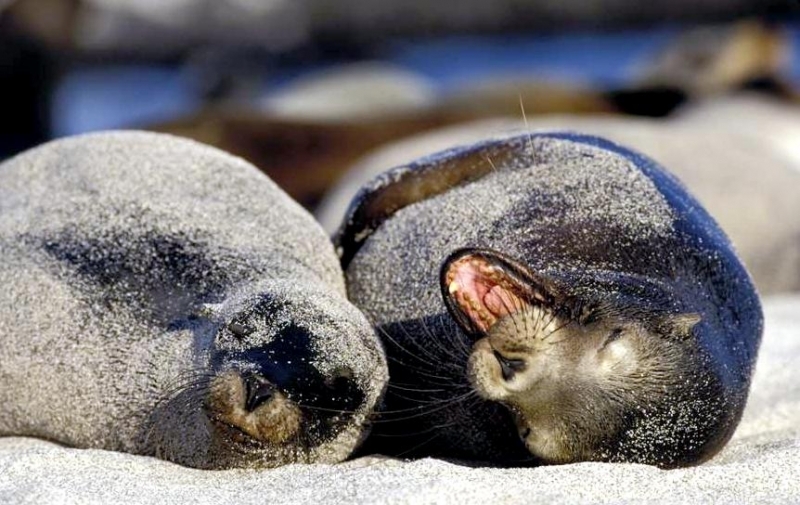 When ashore, the Galápagos Sea Lions rest on sandy beaches & rocky areas in colonies of about 30 individuals. 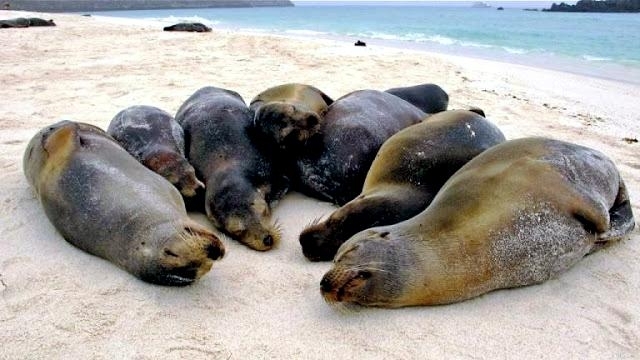 They are extremely gregarious and pack together on the shore even when space is available. 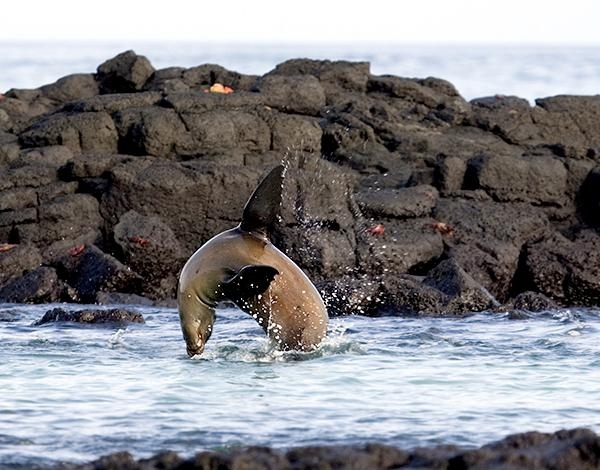 Each colony is dominated by a bull that aggressively defends his territory from invading bachelor males. 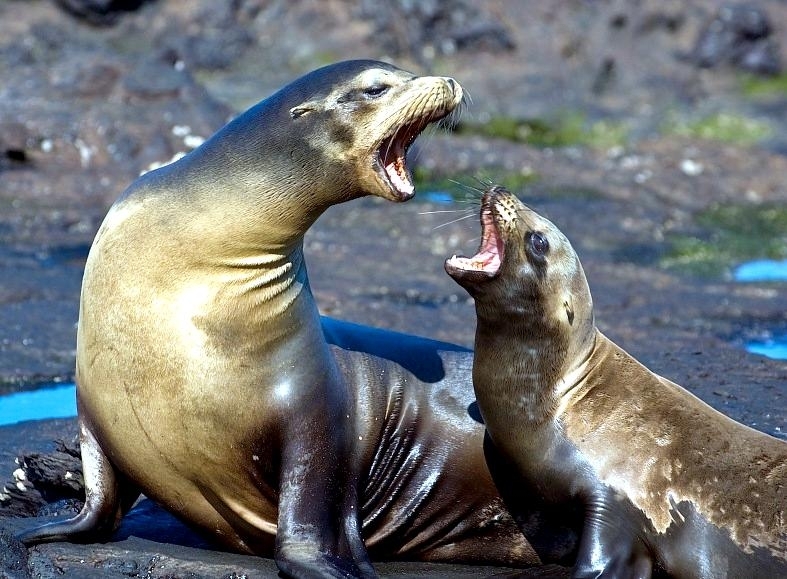 This territorial activity occurs throughout the year and males hold their territories for only 27 days or so before being displaced by another male. 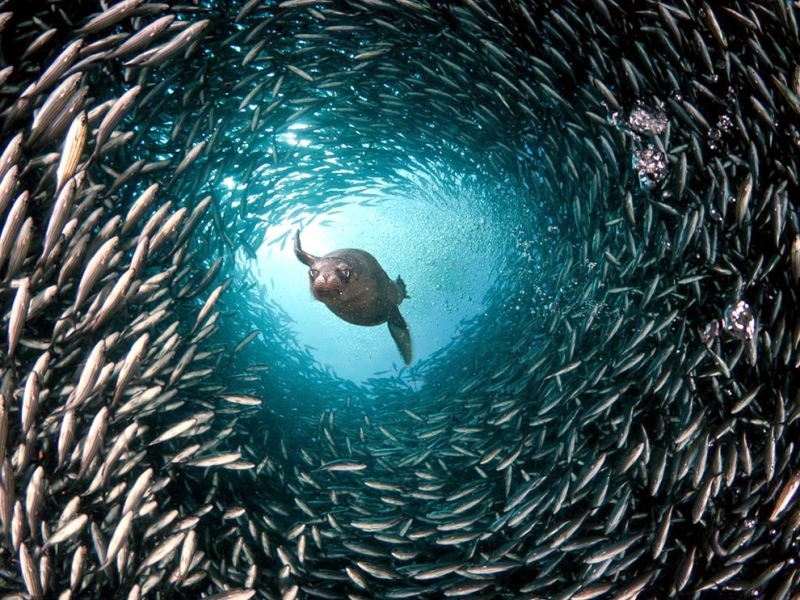 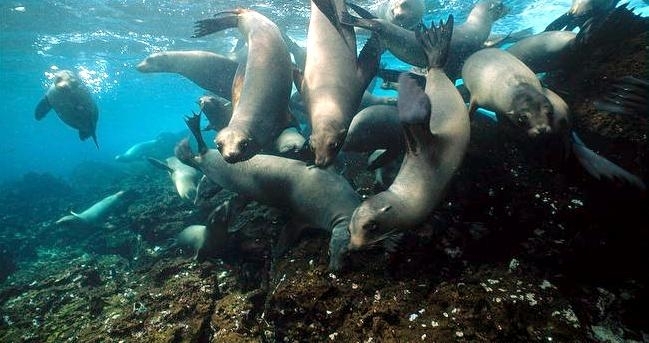 Within this territory the bull Galápagos Sea Lion has dominance over a group of between 5 and 25 cows. 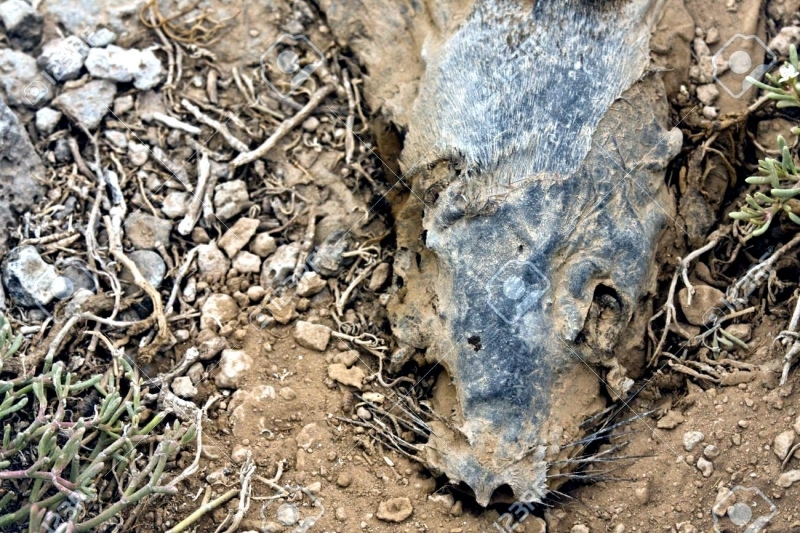 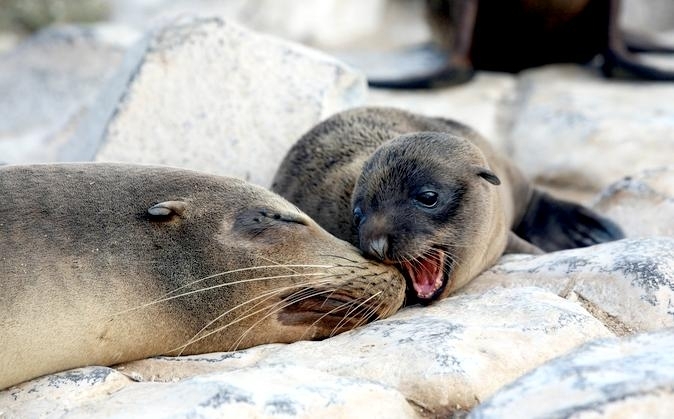 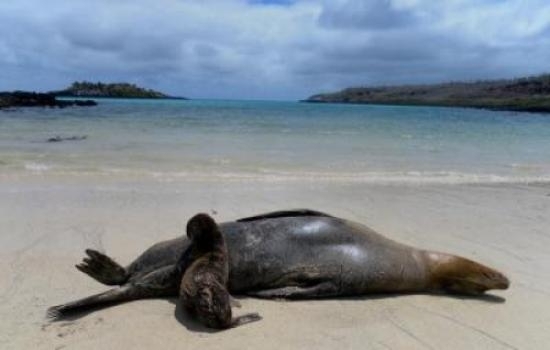 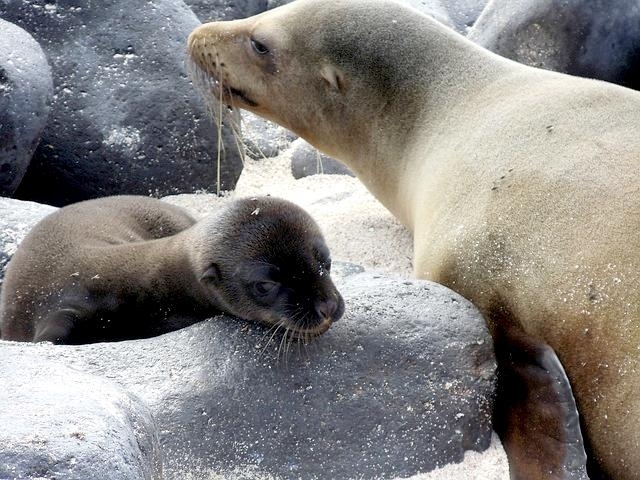 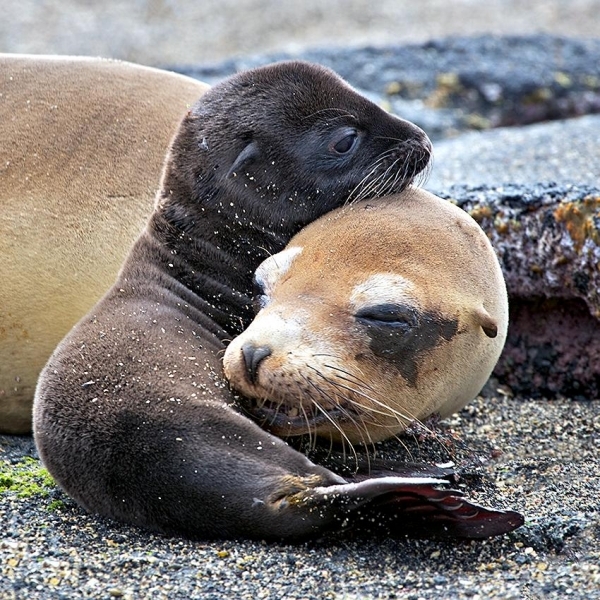 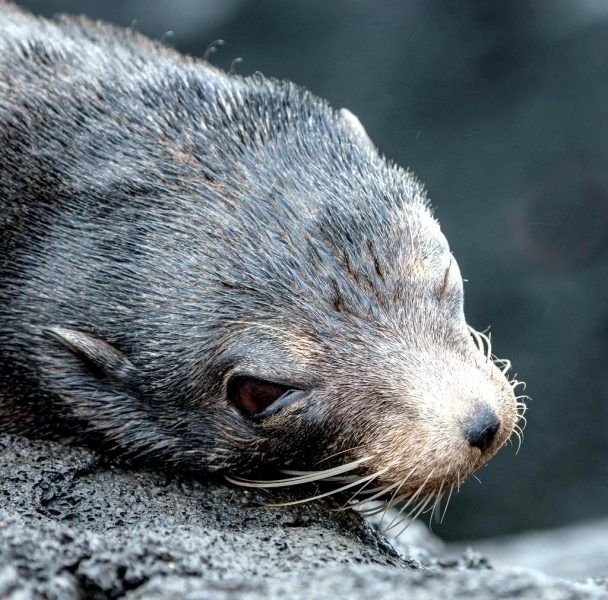 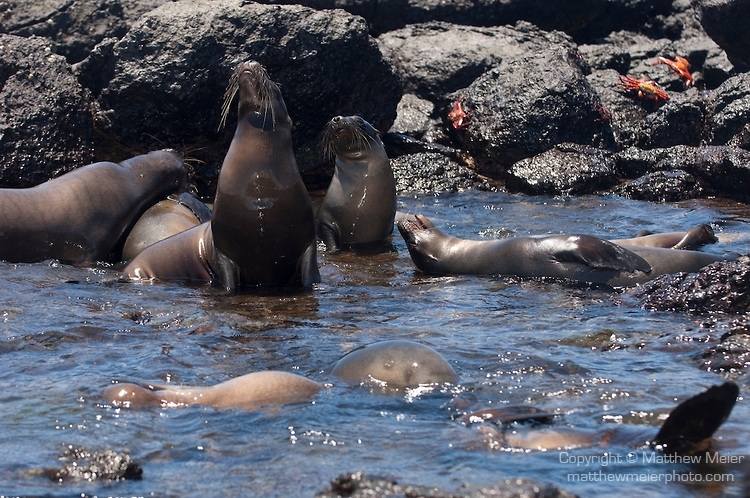 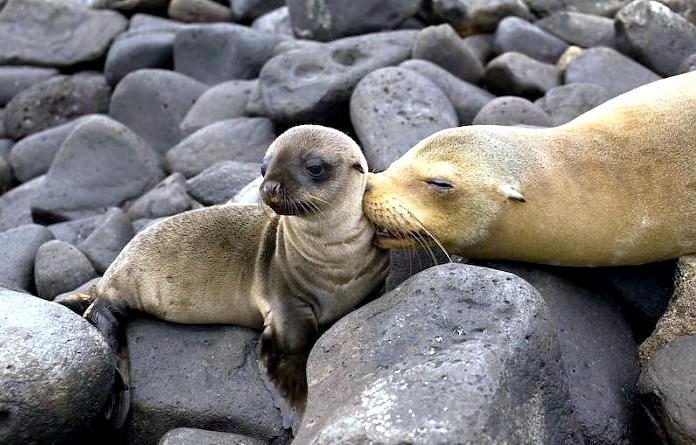 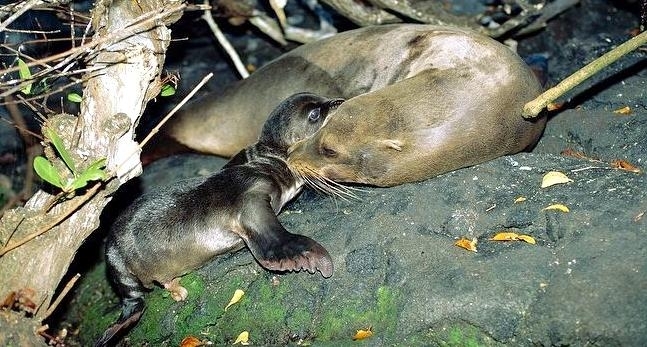 The breeding season is not dependent on migration patterns as seen in other sea lion species, since the Galápagos Sea Lion remains around the Galápagos Archipelago all year round. 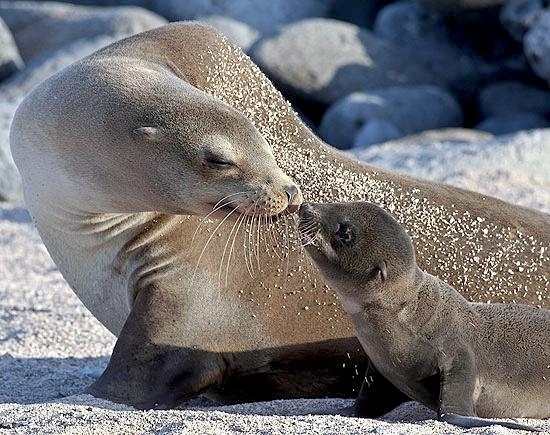 In fact the breeding season is thought to vary from year to year in its onset and duration, though it usually lasts 16 to 40 weeks between June and December. 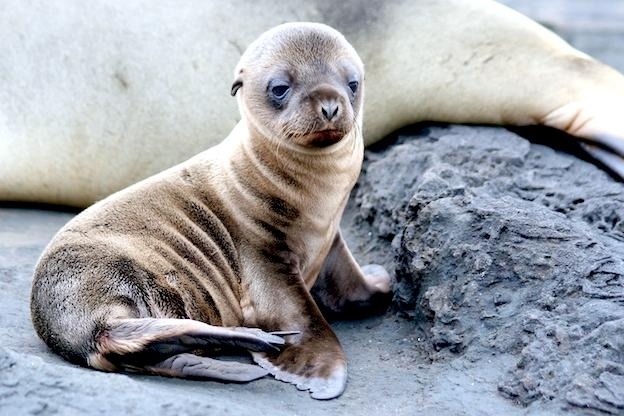 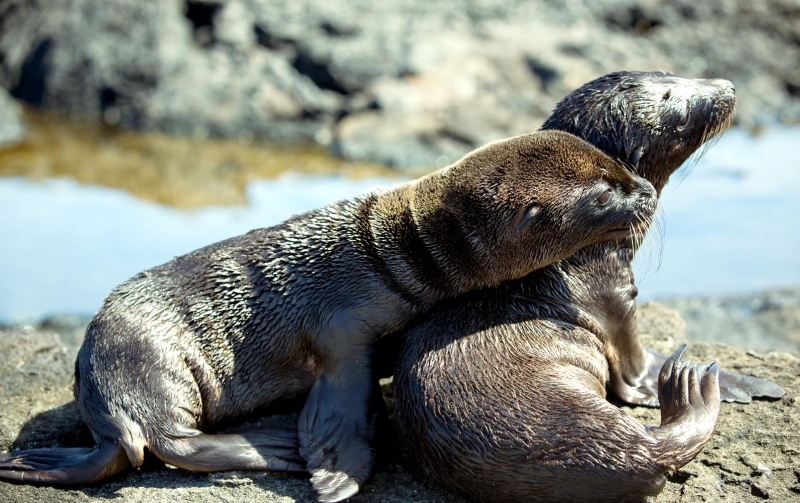 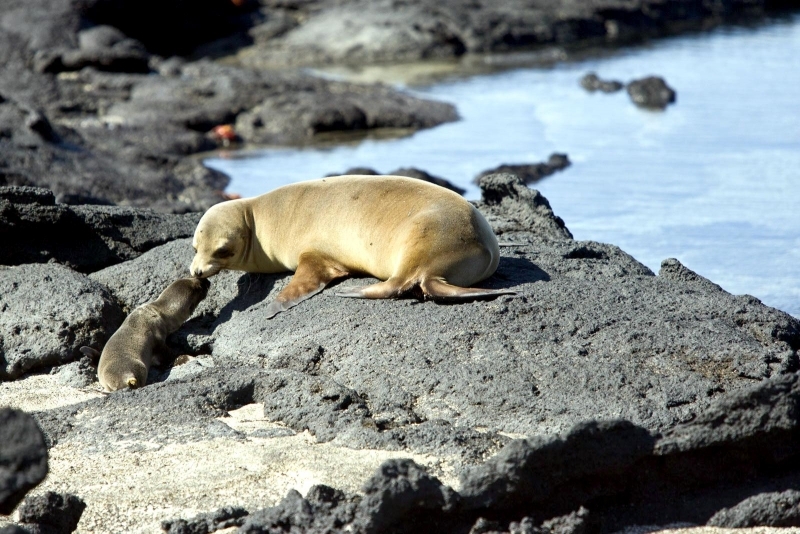 Births therefore also take place throughout the year, with females coming ashore to give birth to a single pup. 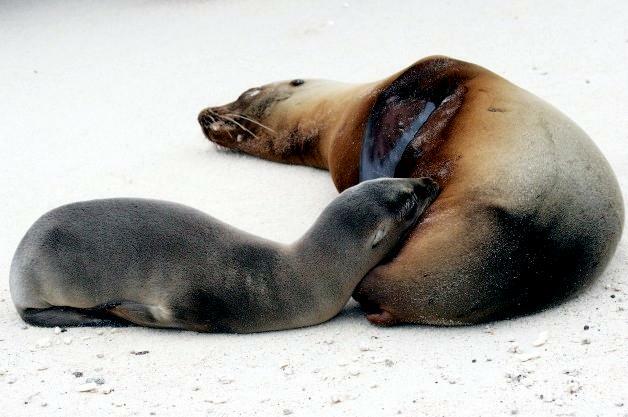 Within 2 to 3 weeks of giving birth females go into oestrous again and actively solicit a male. 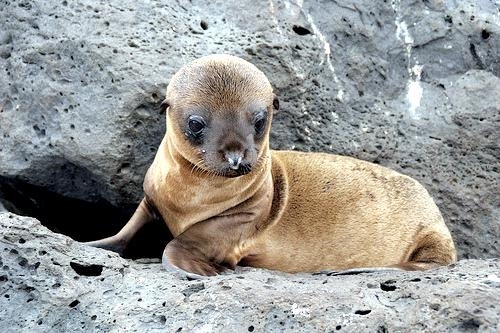 Gestation lasts around 11 months, though it probably includes a 3 month period in which implantation of the fertilized egg is delayed while the female nurses her young. 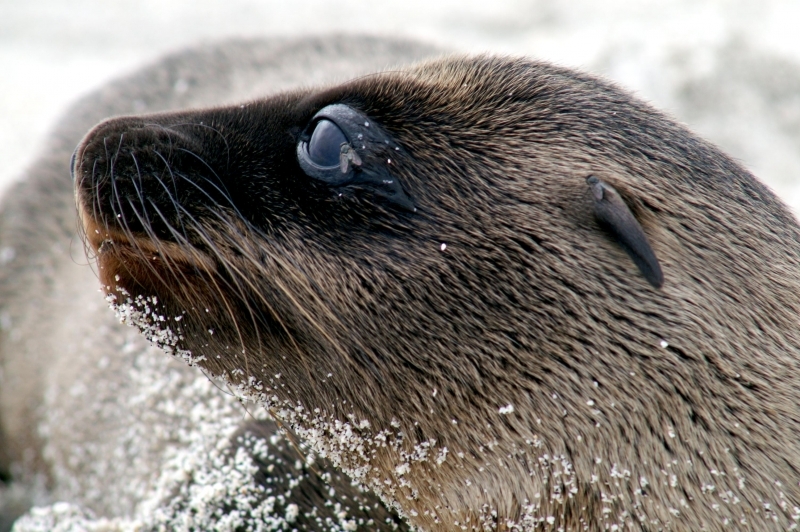 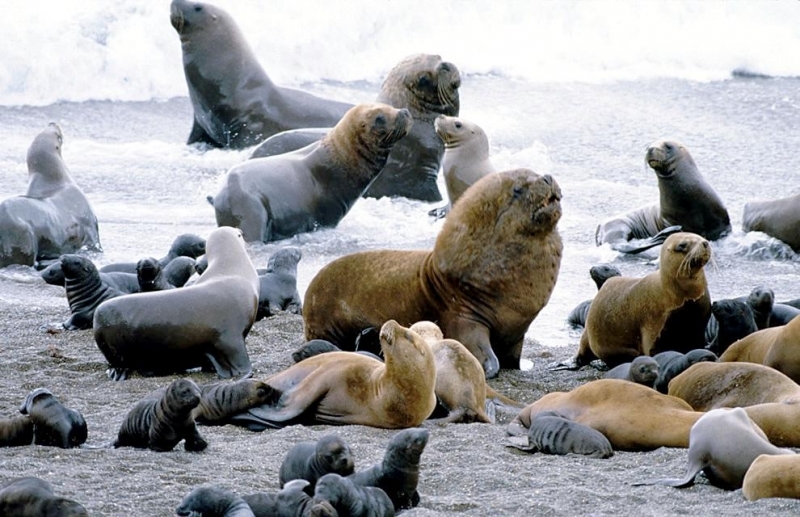 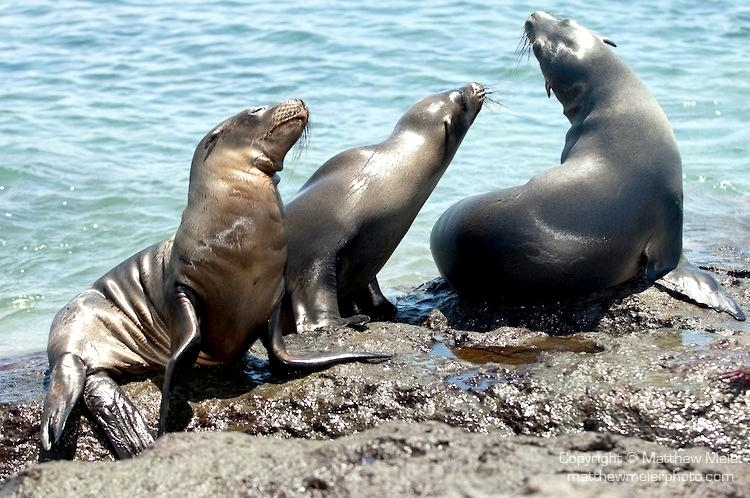 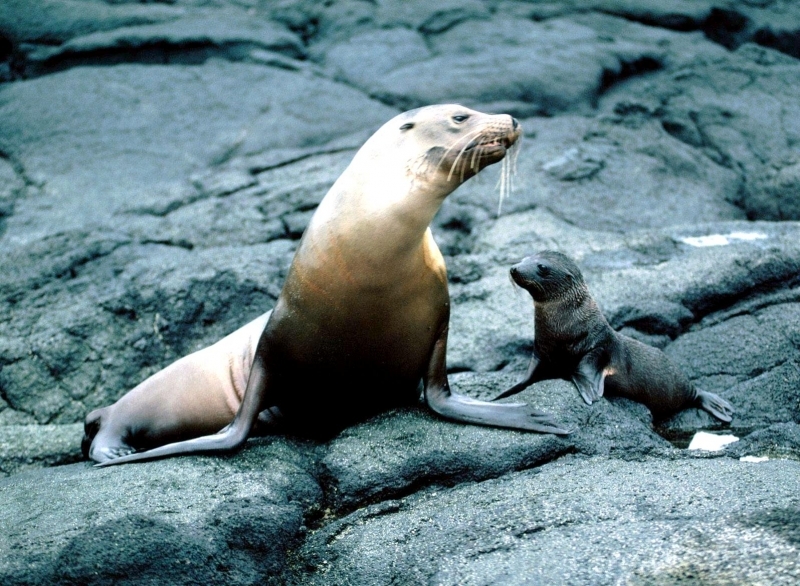 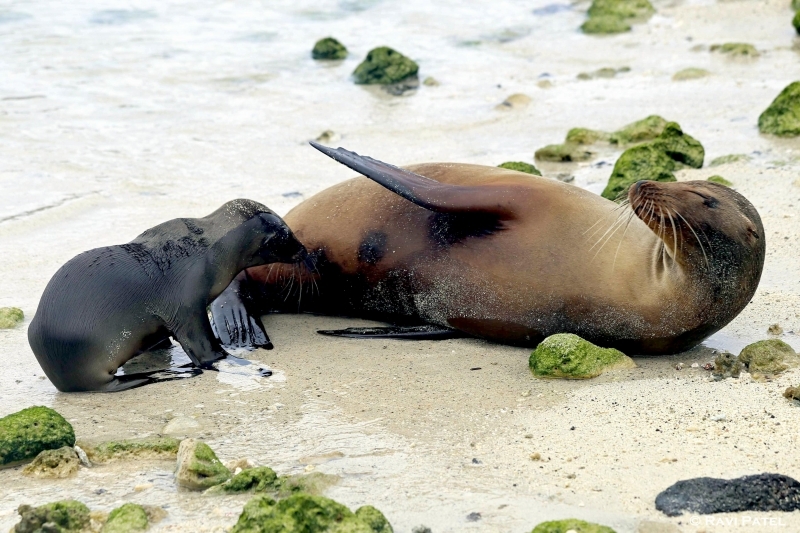 Like other sea lions, Galápagos Sea Lions rely on cooperation within the group. 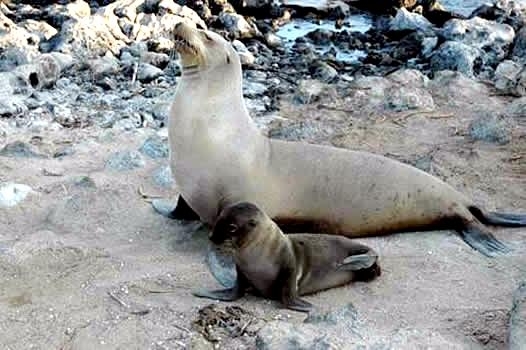 Often, a single adult female will watch over a group of young pups while other mothers are fishing. 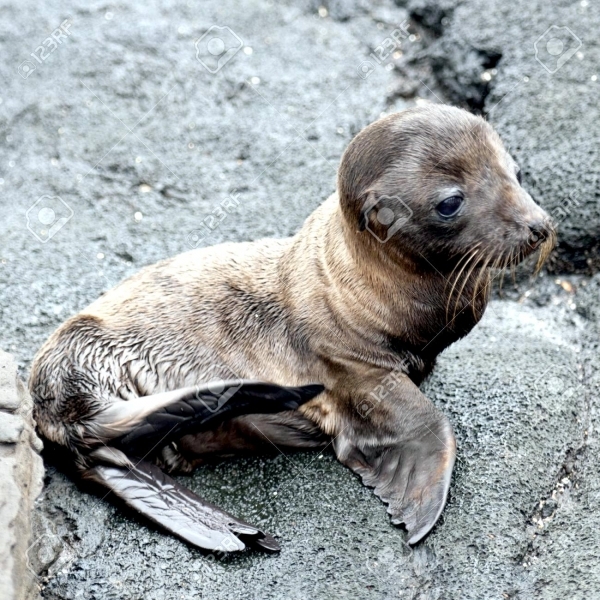 They are careful to keep the young pups out of deep water where they may be eaten by sharks or Killer Whales. 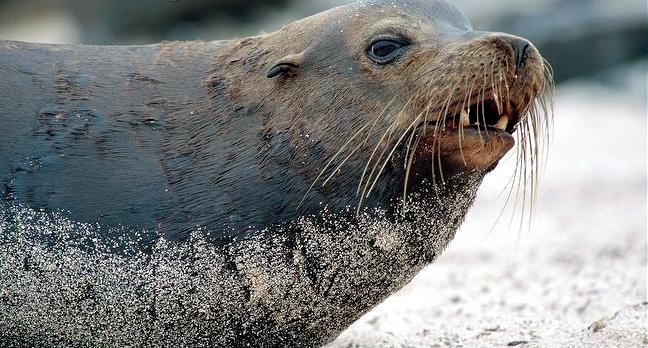 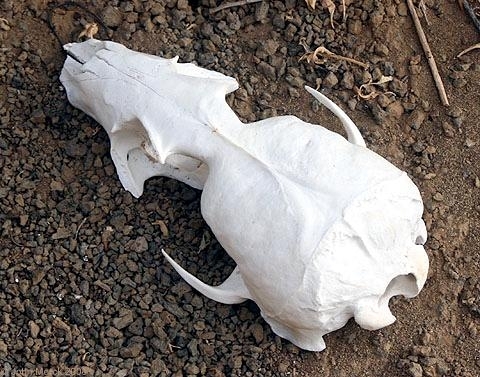 The bull will also watch out for his “family” by warning them of the presence of a nearby shark with barks and even occasionally chasing away a land intruder. 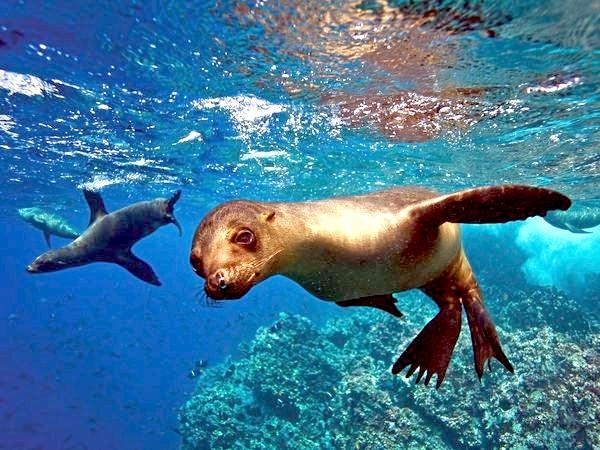 The Galápagos Sea Lion is found only in the Galápagos Archipelago where it is one of the most conspicuous and numerous marine mammals. 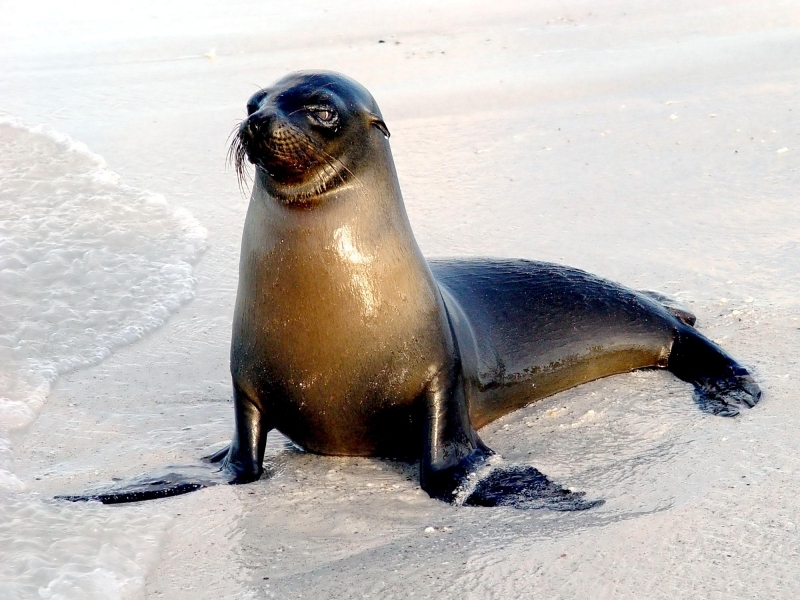 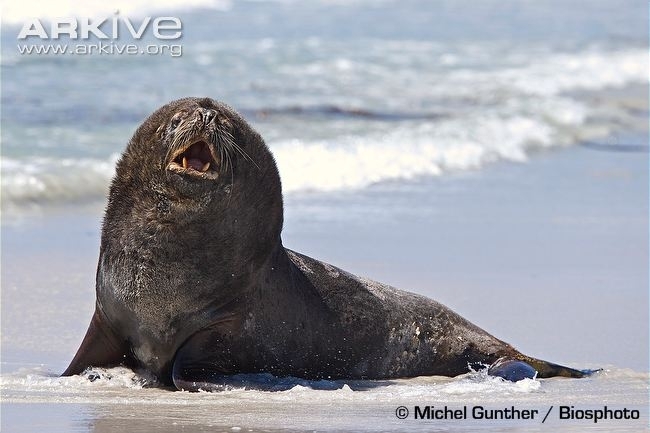 Well adapted to its semi-aquatic lifestyle, it has a streamlined body and powerful fins and as a member of the eared seals (Otariidae family), which includes fur seals & sea lions; this aquatic mammal is able to control its hind flippers independently. 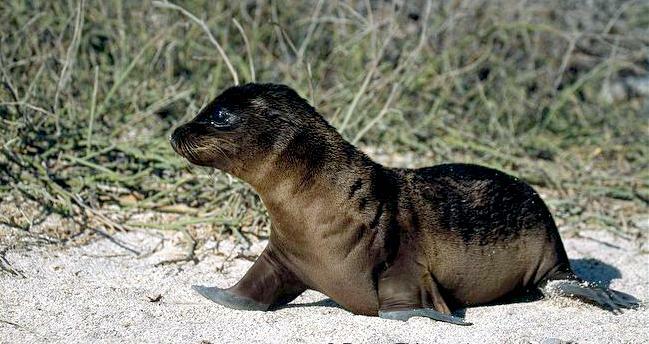 This adaptation allows it more agility on land than seals, which cannot move their hind limbs independently. 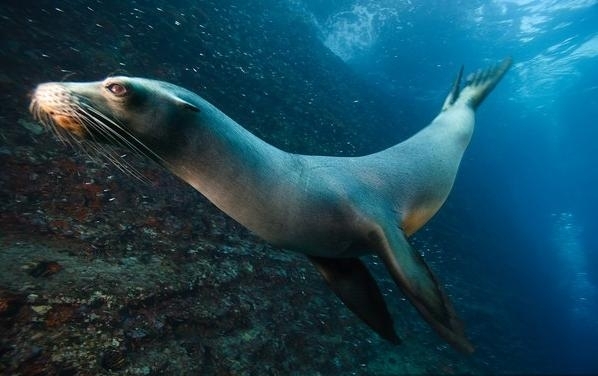 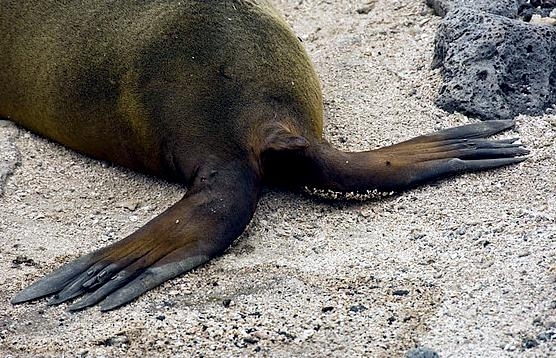 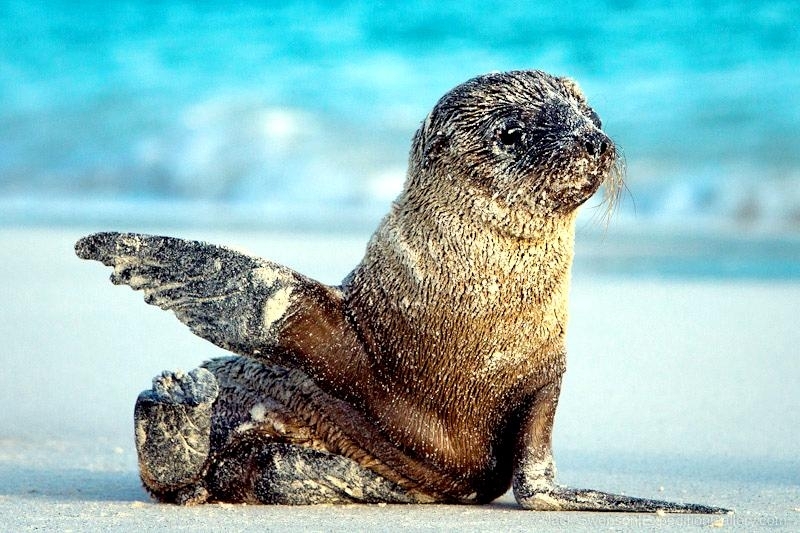 Furthermore, unlike the true seals (family Phocidae), the Galápagos Sea Lion swims using its strong and well developed fore flippers. 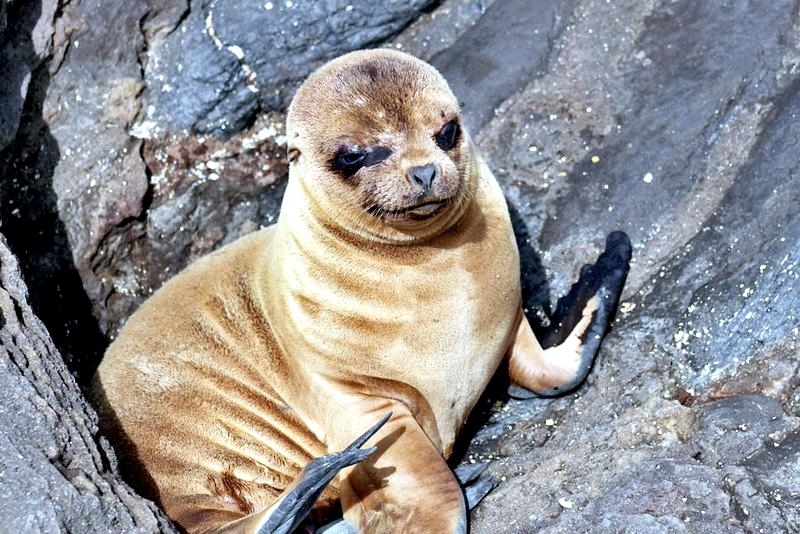 Adult males are much larger than females and are brown in color while females are a lighter tan. 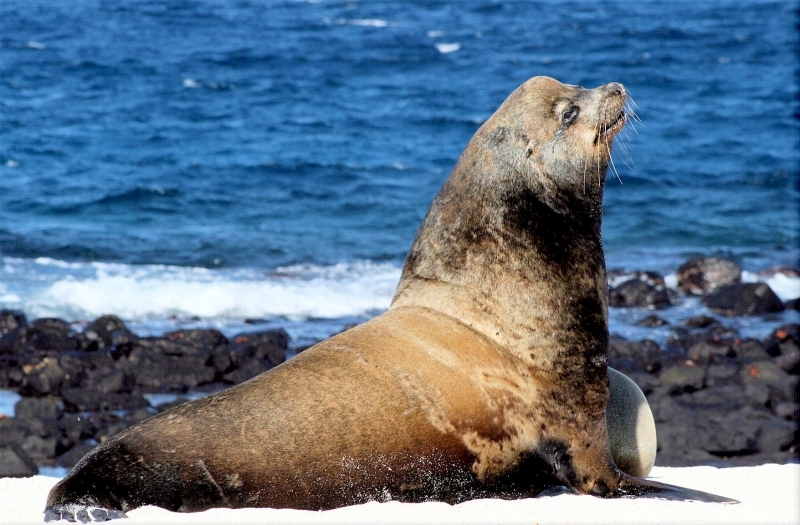 Adult males are also distinguished by their raised foreheads, and the hair on the crest may be a lighter color. 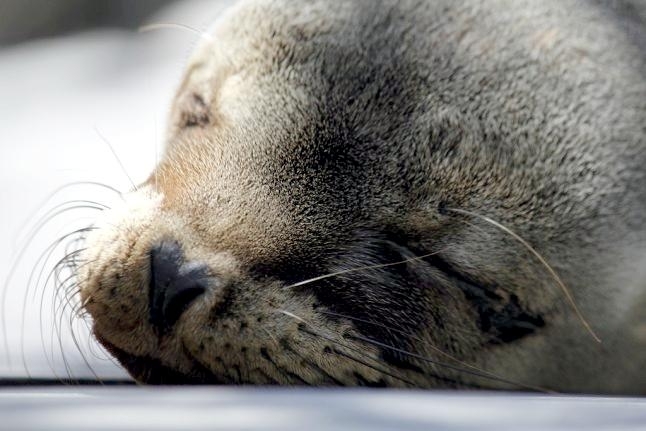 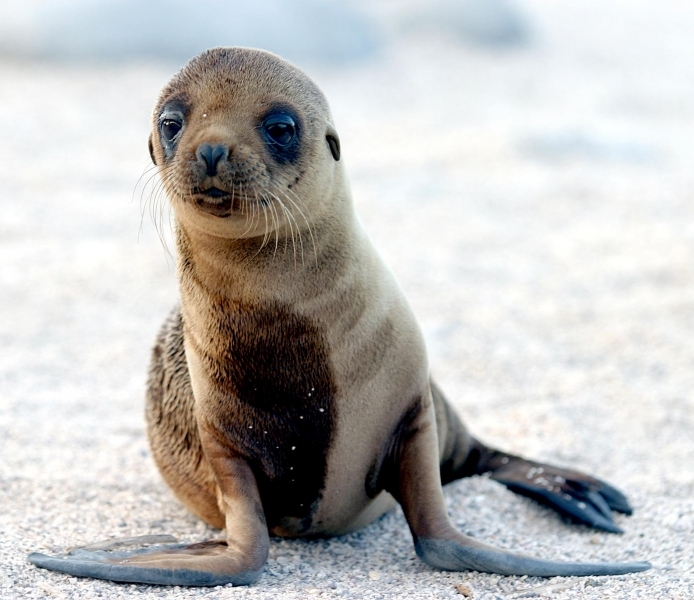 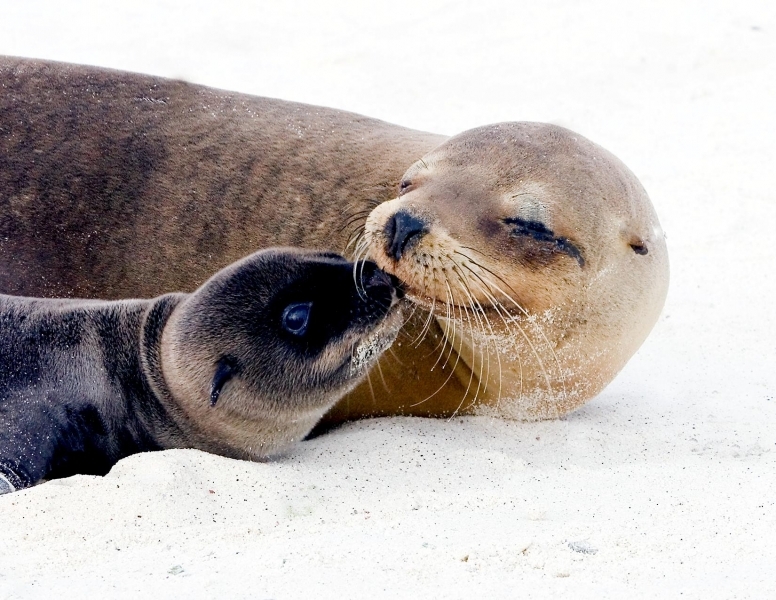 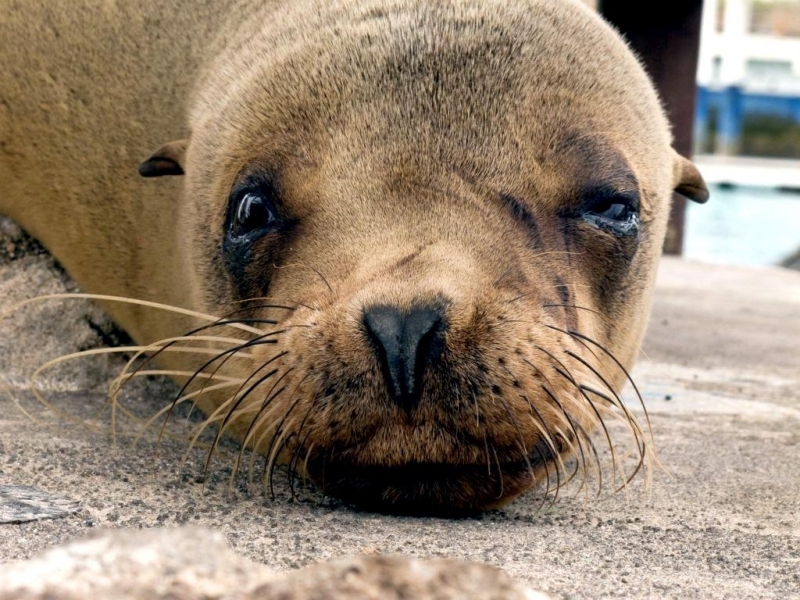 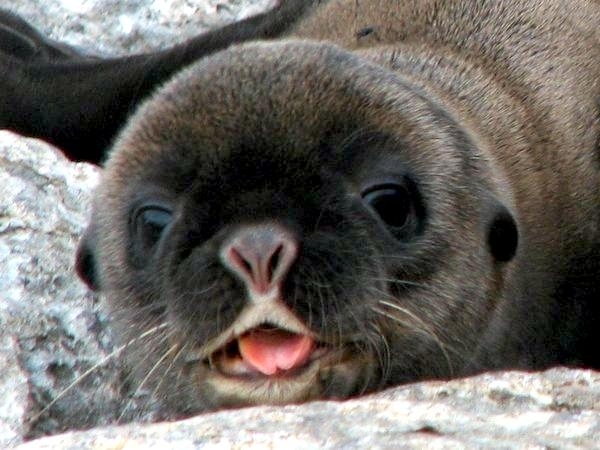 Juvenile Galápagos Sea Lions are chestnut brown in color and measure around 75 centimeters at birth. 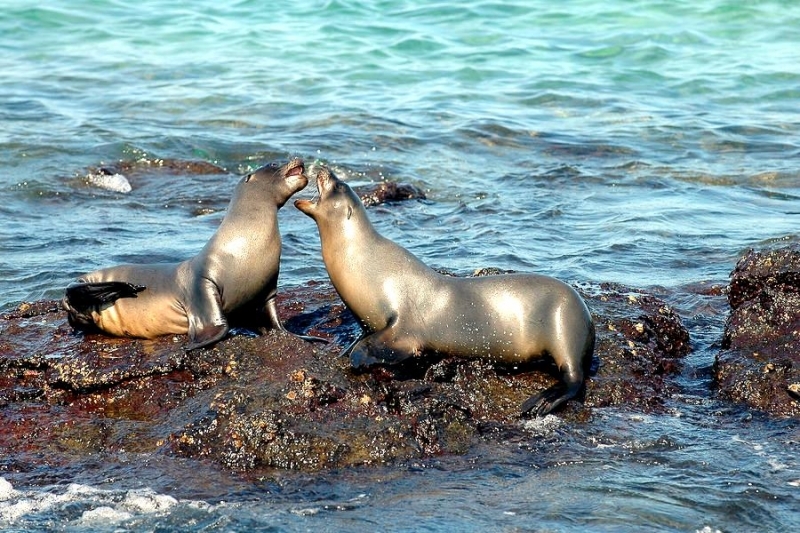 These sea lions reside on all the main islands, rocks and other diminutive islands of this archipelago. 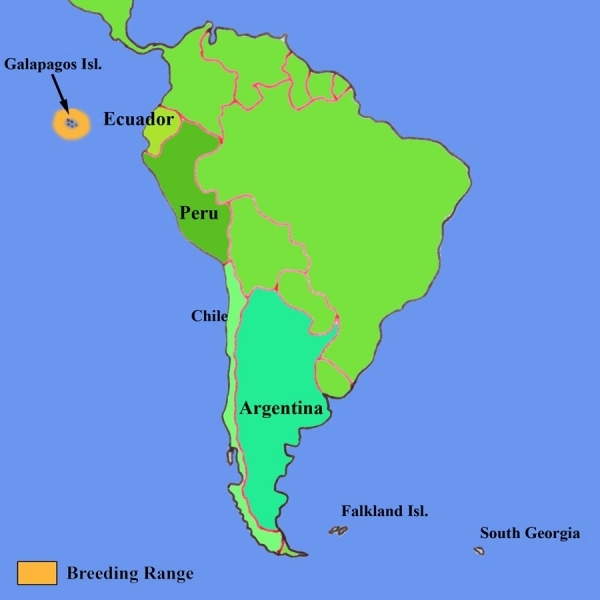 Some are also found ranging along Ecuadorian north coast to Isla Gorgona of Columbia. 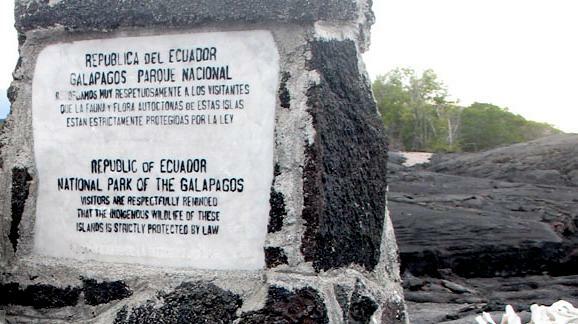 In 1986, a group arrived at Isla de la Plata near the shores of Ecuador. 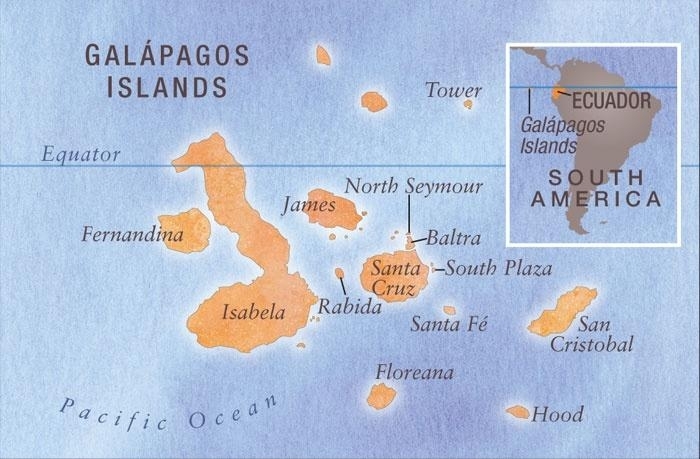 Some were even spotted 500 kilometers southwest of Costa Rica on Isla del Coco. 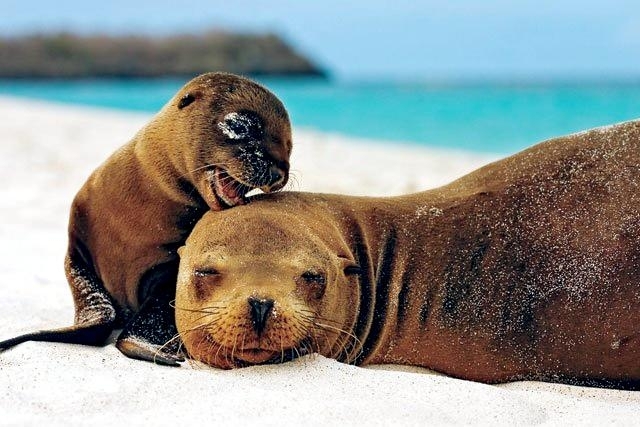 Galápagos Sea Lions are polygynous and males hold territories mostly along the shoreline in shallow water that they vociferously and aggressively defend. 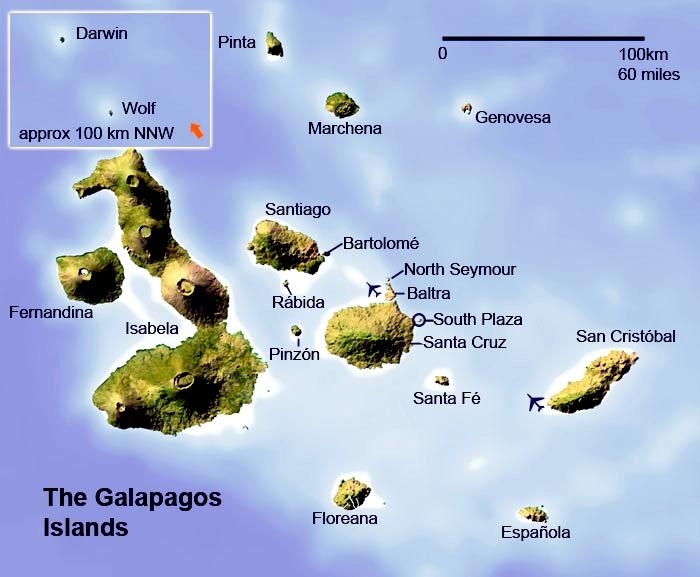 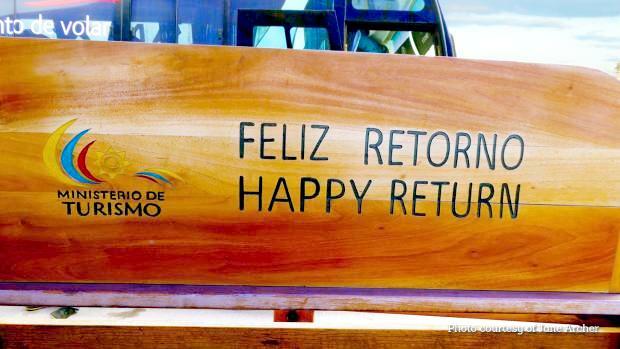 Male tenure on territories usually lasts from a few days to one month. 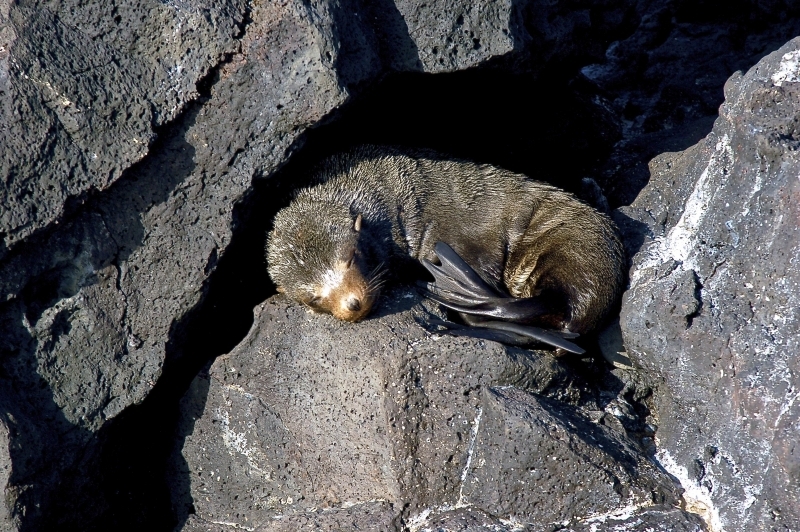 Males may be more than once on territory during the drawn out reproductive period. 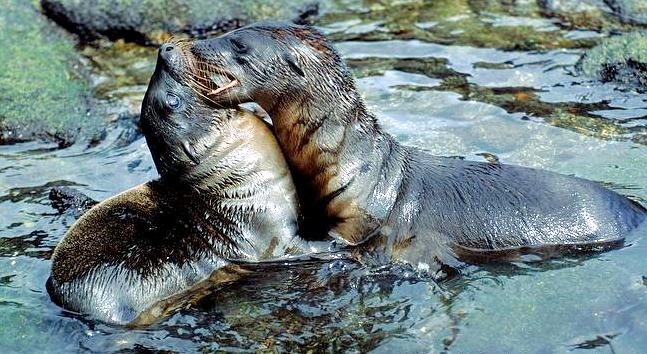 Most copulation occurs in the water. 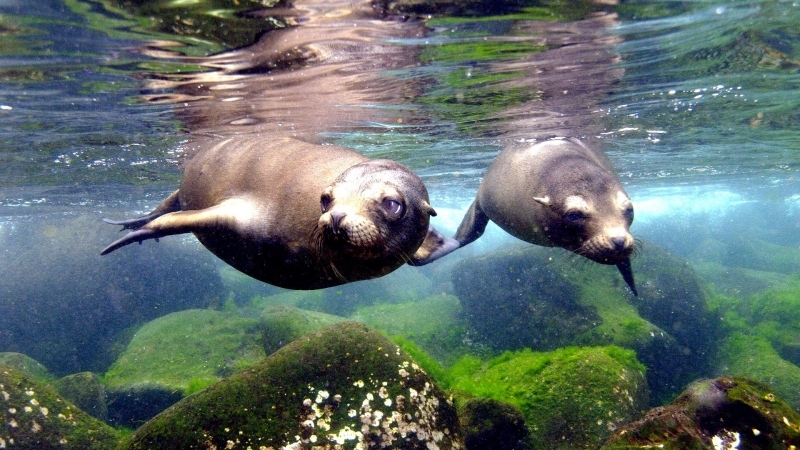 Galápagos Sea Lions are non-migratory. 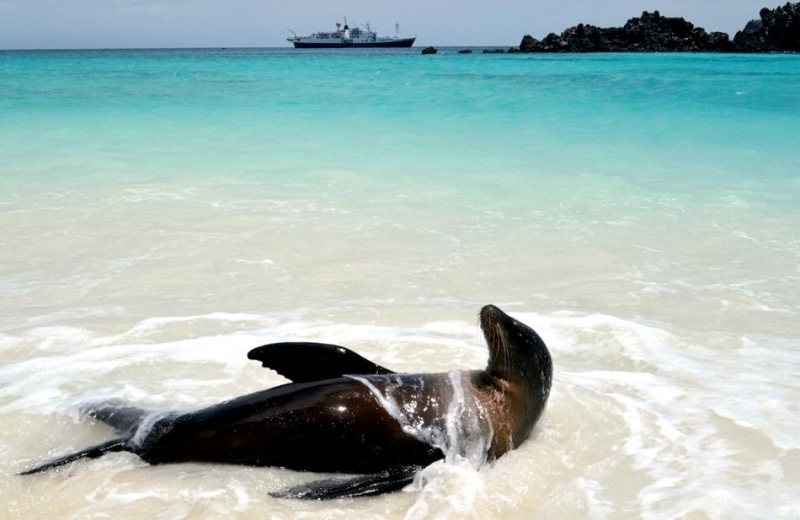 They are rather unafraid of humans when ashore, at least in the sites where they regularly encounter humans. 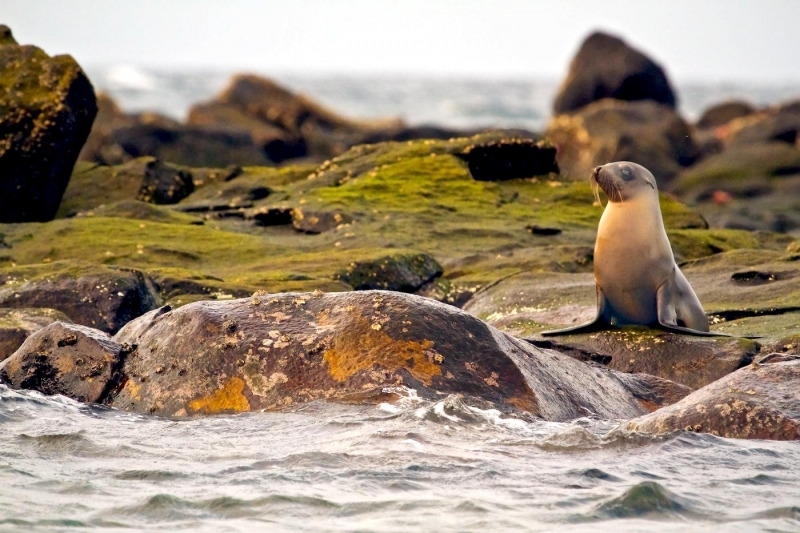 Haul-out sites can be on rugged shoreline types including steep rocky shorelines, ledges and offshore stacks, but colonies are mostly on gently sloping sandy & rocky beaches. 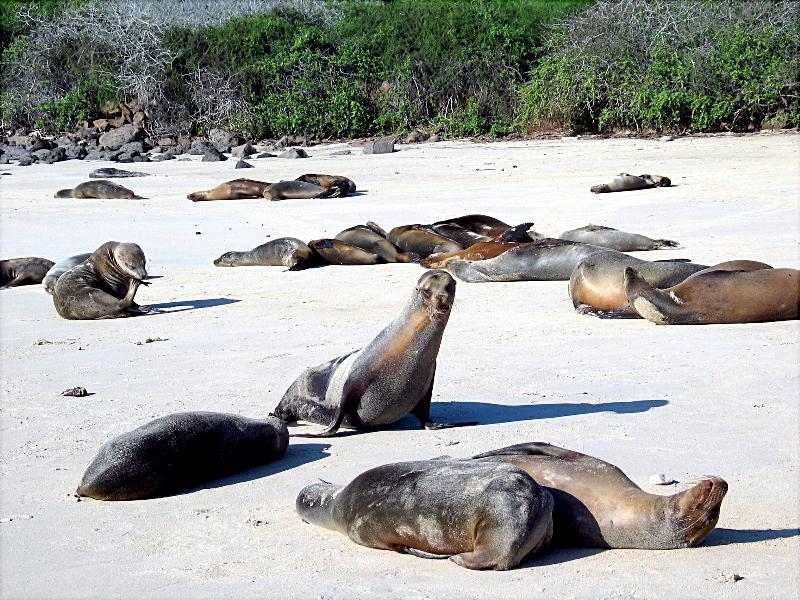 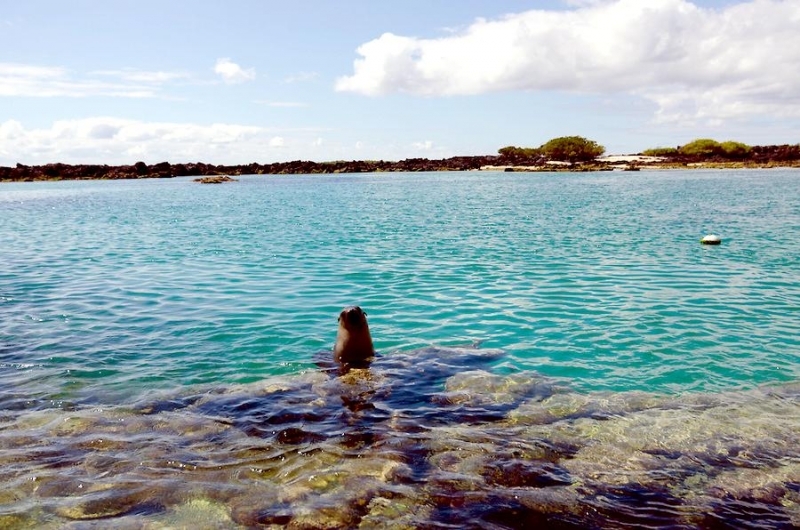 Galápagos Sea Lions will use shade from vegetation, rocks, cliffs and enter tidal & drainage pools or move into the ocean as needed during the heat of the day to avoid overheating.